[Whites are completely unaware of how other races work, and whites tend to think that everyone behaves like we do. In the case of the Jews, this is not so. I want to show you that with the blacks this is also not true. Whites generally, tend to think that all wars are like WW1 or WW2. But that’s not the case. Most wars are very different to that. Let me show you something "from the horse’s mouth” so to speak. Below is an article from a Zimbabwe (Formerly Rhodesia) website. It relates to the topic of "The Third Chimurenga”. A Chimurenga to the blacks is an uprising/war. In the article you will see that they refer to 2 “Chimurengas”. They say the first Chimurenga was against Cecil John Rhodes and the British South Africa Company. This is a reference to a war fought between the blacks and whites in Rhodesia in 1896-7. The Second Matabele War, also known as the Matabeleland Rebellion or part of what is known in Zimbabwe as the First Chimurenga, was fought between 1896 and 1897 in the area then known as Rhodesia, now Zimbabwe. It pitted the British South Africa Company against the Ndebele (Matabele) people, which led to conflict with the Shona people in the rest of Rhodesia. In March 1896, the Ndebele revolted against the authority of the British South Africa Company in what is now celebrated in Zimbabwe as the First Chimurenga. The Mlimo (or M’limo, or Umlimo) the Ndebele spiritual leader, is credited with fomenting much of the anger that led to this confrontation. He convinced the Ndebele and the Shona that the settlers (almost 4,000 strong by then) were responsible for the drought, locust plagues and the cattle disease rinderpest ravaging the country at the time. So that was the First Chimurenga, as defined by the Blacks. Now the Second Chimurenga, as defined by the blacks is the war we know as the Rhodesian Bush War, which was fought in the 1960s-1970s which ended with the formation of Zimbabwe and Mugabe being the first black leader. In fact the Christian Bishop Muzorewa was the first black leader, but he was a total flake and idiot and he gave in to having new elections and Mugabe cheated his way to power. So those are 2 WARS as defined by the blacks that tie up to actual wars that whites will recognise! But what if I told you there was a Third Chimurenga? That there was a WAR between the blacks and whites in Zimbabwe? You might say: There was no other WAR. The blacks and whites did not shoot each other in Zimbabwe after 1980! Where was the WAR? Well, there was a WAR, but the whites don’t recognise it as a WAR, but the blacks did recognise it as a WAR! What we whites call “The Farm Invasions”, is actually defined by the blacks as a WAR! The period 2000-2010 (or even later), is actually defined by the blacks as a WAR. Robert Mugabe himself spoke about “the Third Chimurenga”. Not only that, but I must be one of the few people who have a copy of “the Third Chimurenga”. Mugabe wrote it (probably had a ghost writer), and it was used to indoctrinate the Militia whom Mugabe called up. Mugabe even said at the outset that if half the black population starves to death, it would be worth it – i.e. seizing the farms. There was murder. There was a lot of violence (mostly black on black), carried out by the militia on the orders of the Govt for years. But whites just look on this as “black violence” and never regard those events as a WAR. Yet, Mugabe implemented National Service and called up 200,000 young blacks who formed this violent militia. In this article below which I’m reproducing in full from a Zimbabwe website, you can read what the blacks define as the 1st, 2nd and 3rd Chimurengas and you’ll see that I’m right in my interpretation. But in the West and among whites, we do NOT recognise the “Farm Invasions” as an actual WAR! Yet the blacks saw it as that, and still see it as that. This is why, in South Africa, whites must take more notice of the seizure of land, because if you study South African history, you’ll see that this is Phase 2 of a 2 stage revolution. The ANC (African National Congress) knew that in stage 1 they needed to seize Political Power. But they also knew that once they had Political Power, that in stage 2, they would seize Economic Power. This is the final part of their communist dream. This is why whites must take the “Land Reform without compensation” seriously. 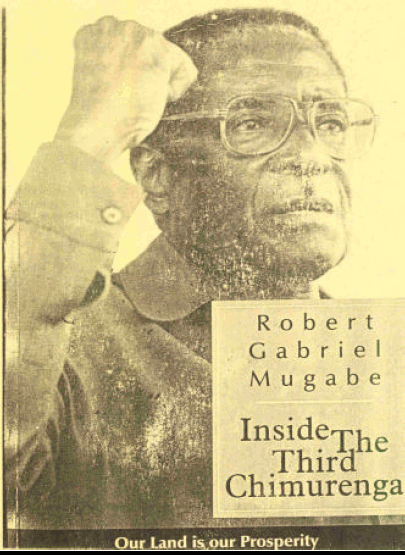 The image below is the front cover of Robert Mugabe’s book: Inside the Third Chimurenga. I have a full copy of the book. The Third Chimurenga in Zimbabwe was an extensive process of repossession of land by the majority local indigenes from the white minority commercial farmers. It was initiated by the Zanu P.F government on the 15th of July 2000 under the leadership of Robert Mugabe in order to repossess and redistribute land. The centrality of land at the heart of this scheme has resulted in the Third Chimurenga being intimately associated with the Fast Track Land Reform Program. The Lancaster House Agreement of 1979 which brought independence in Zimbabwe stipulated that land was to remain in the hands on the minority white commercial farmers and the government would only acquire land through the Willing Buyer Willing Seller system which received funding from the International Monetary Fund (IMF).< These terms were included in the Lancaster Constitution and were meant to be reviewed after the first ten years. However, in 1990, serious disagreements emerged when the British government and Zimbabwe failed to reach a consensus with regards to the model which was to be deployed in the repossession of land.< These problems were kept under the carpet until 1998 when the local populace began to question the government’s reluctance towards land repossession. The fighters of the Second Chimurenga locally referred to as the war veterans were on the forefront in calling for land redistribution. In 1998, Chief Enock Zenda Gahadza Svosve of the Svosve area of Mashonaland East province invaded the nearby Desktop Farm and this signalled the beginning of the agrarian reform.< This resulted in the legalisation of land repossession by the Zimbabwean government in 2000 through the Fast Track Land Reform Programme which was dubbed the Third Chimurenga. The basis of the Third Chimurenga was to repossess and redistribute large tracts of land from the minority white community into the hands of the black populace who had for long been overpopulated in the infertile and somewhat drought prone areas of the country. Hence the main rationale was to compliment the country’s political independence with social and economic independence through land redistribution. Under the leadership of the then Minister of Agriculture Joseph Made, the government crafted a number of frameworks and policies which governed land redistribution.< The Programme, which was launched on 15 July 2000, was designed to be undertaken in an accelerated manner and with reliance on domestic resources. The Programme was a fundamental departure from previous philosophy, practices and procedures of acquiring land and resettling people. The Fast Track Land Reform Programme was initially targeted at de-congesting communal lands. In the later stages it was extended to incorporate the creation of an indigenous commercial farming sector. Under the Fast Track Land Reform Programme from 2000, the government target the redistribution of not less than 500 million hectares of land. During this phase, land was acquired compulsory in accordance with the Land Acquisition Act (chapter 20:10) as amended. The Government adopted the one-man-one-farm policy at the inception of the land reform and resettlement programme and continues to uphold this policy. In the case of a single owned farm being acquired due to its being contiguous to a communal area, Government undertook to provide the affected farmer with another elsewhere around the country. In the Fast Track phase, two resettlement models were used, Model A1 and Model A2. Model A1 was intended as decongesting communal lands. Model A2 was aimed at creating a cadre of black commercial farmers and was based on the concept of full cost recovery form the beneficiary.< Settler selection was made on the basis of applications submitted to the Ministry of Lands Agriculture and Rural Resettlement. From a historical perspective, the Third Chimurenga was more than a conflict of interests between the Zimbabwean government and the white farmers. It was in fact a war to control the economy. Land as a natural resource is vital in the development of every polity. For the white farmers, the Third Chimurenga was a loss of their autonomy, a loss of their means of production, a loss of their source of income and livelihoods, and above all, a loss of their fore fathers’ legacy which they had enjoyed for a whole century. For the autochthons and the Zanu P.F government, the Third Chimurenga was the process of fulfilling of addressing the imbalances and the legacy of the colonial period, it was an era of putting the nail on the coffin of colonialism, an epoch of complimenting political independence with economic independence. It was in fact the incarnation of the dream of the First and Second Chimurenga; economic freedom through land ownership by the indigenous populace. Whether the Third Chimurenga was a success or not remains a subjective debate which calls for vast empirical data, statistics and literature. Whites can win, but I think you too haven’t understood WW1 and WW2. In both cases Jews were in the backround, but controlled things, so whites killed each other in huge numbers; Jewish money, and the resulting control over propanda and weapons devastated Russians and Germans in particular. Most whites had no idea that the BBC, Churchill, the US news media, and the Jews in Russia with e.g. ‘Pravda’. Most Americans had no idea that ‘Christians’ were working against them, as were Woodrow Wilson, Roosevelt etc, and, arguably, Hitler. And the Jews lost very few people at all. Incredible stuff, but it has to be faced. The USA nominally has free speech, but in practice it’s been free speech for Jews. It’s only with Internet that people are learning how much they’ve been lied to. Weaponry is expensive and as long as Jews control it, and US soldiers in particular do their propagandised mercenary stuff, as British soldiers did for Jews in the Boer War, I dread a full clampdown on Internet (and would be interested to receive reliable info on this possibility). All-out race war is the only thing that can save our race.Even if we have to lose half! I like your attitude. I’m also a firm believer in the white males returning to their true status as warriors. This can definitely work. We need to stand firm by ourselves and we need to fight to WIN! I don’t believe we’d lose even half even in a worst case scenario. I’m utterly convinced that no matter the odds, we would acquit ourselves more than adequately. The Jew and the Liberal in the ruling class are our firmest enemies. If we had to face off in a battle on the ground I’m convinced we’d shock the world. I reckon whites in ANY WHITE COUNTRY as well as South Africa, can totally astound the world. Its very doable. We’re far from finished. Most of this stuff is just NOISE from our very vocal enemies. We will see who stands to fight when that day comes. You might be surprised at how many of them melt away into the shadows the day when white men pick up their guns. As for the USA you have free speech and guns – you’ve got a totally winning recipe right there. And some of us would love to join you if the day for a fight comes. I’m all for: RAHOWA!!! !